I am obsessed with the variety of shapes for bags this Spring season. Backpacks are making a resurgence (hello 90s! ), along with drawstring bucket bags, sleek lady-like satchels, teeny-tiny crossbody bags & delicate clutches. And the finishing touches are so fun! With chain straps, tweedy textures, chunky tassels & blast-from-the-past jelly materials all topping the trend watch lists. If you're in the market for a new Spring purse, now is the time to head into Dillard's! They are gearing up for the Handbag Trade-In Event (April 2 - April 6) where if you bring in a bag to donate, you'll get up to $50 off your new purse! Some of the brands they carry are so special that they NEVER go on sale, so this is a choice time to pounce!! 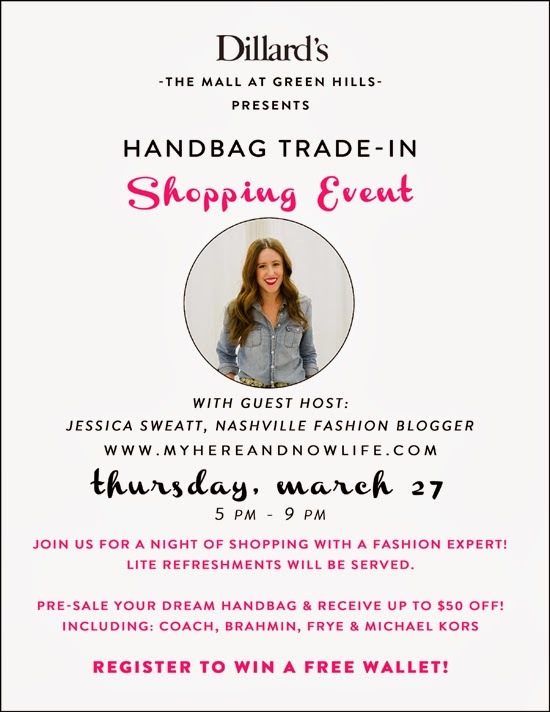 I will be at the Green Hills Mall Dillard's this coming Thursday (3/27) 5 - 9pm, talking Spring style, picking out purses & looking forward to meeting you! Be sure to bring in a bag to donate, help out a great cause, & score a deal on your new purse. The Green Hills Mall Dillard's will be giving donated handbags to Operation Stand Down, a local military charity. This organization centers their mission around assisting former vets & their families. The donated bags will go to female vets who have been given housing in the Nashville area, & need the adequate interview + lifestyle materials. I adore that ladylike Brahmin satchel! love the Brahmin clutch and the bucket bag!! Sounds like it will be such a fun event! I adore crossbody bags, they are so great for hands free shopping. That mint one is perfect! Two, five, and ten are my favorite! So pretty! So dangerous! I have my eye on a bucket bag next!! I love #5, the croc cross-body - the color and texture are both beautiful. I also love the idea of an event/sale around donating purses!